Whether for a shed, gazebo, fence, deck or patio, the preservation of wood in the outdoors is of vital importance to any homeowner or Do-It-Yourselfer. 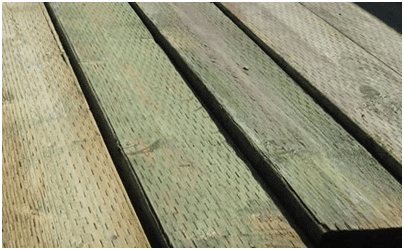 Without proper protection, pests, moisture, salt, sun, rain, frost and everything in-between can have dramatic effects –none of them good—on the stability and appearance of lumber-based structures. Although no wooden creation can last forever, by diligently adhering to a few basic precautions even the most amateur craftsman can safely shield his investment from the normal toils of element exposure. This guide will highlight and explore the basic fundamentals of exterior wood preservation, fundamentals that –if assiduously followed—will ensure lasting looks and full functionality. The old cliché “you get what you pay for” may not apply to everything, but it certainly applies to wood, as nothing dooms an outdoor project faster than the use of inadequate, low-quality lumber. Your shed will face the weathering effects of the sun, wind, rain and temperature on a daily basis, not to mention the constant threat of insects, molds and general detritus, so plan accordingly. If unsure what the greatest hazards in your specific region might be, talk to the professionals at your local lumberyard. Any decent purveyor should have a wide selection wood and a surplus of applicable knowledge for any project big or small. Untreated: Though it comes at an additional cost, a number of builders don’t mind paying for quality, untreated wood. Aim for varieties resistant to the adverse effects of warping, fading, moisture and pests. Generally speaking, try to purchase heartwood –the older, darker, innermost wood of a tree—rather than sapwood. Ask someone at your local lumberyard for an example between the two types; being able to physically compare the two helps clarify the difference. Aim for the following species: Redwood, Cyprus and Cedar. Make sure that the wood has been thoroughly dried to prevent post-purchase shrinkage. If there is any indication that the wood may be green, save yourself the headache and do not purchase it. Treated: By far, the most commonly used type of outdoor wood is treated, specifically pressure treated, pine or fir. 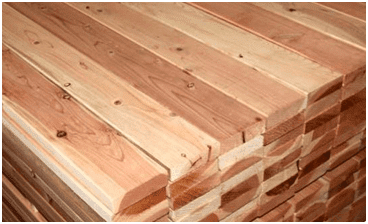 Though cheaper and more readily available than untreated Redwood or Cedar, treated wood (specifically pressure treated) does have some drawbacks. The wood tends to acquire an unnatural hue (usually a green sheen) as a result of the chemicals in the treatment process, though this hue can be dyed out. Health concerns surrounding the safety of said chemicals have increased in recent years. Still, pressure treated lumber will likely find its way into your project in one way or another, so take these three drawbacks with a grain of salt. * Though not suggested as an untreated lumber, Pine and Fir are widely used and generally recommended if they have been pressure-treated. The pressure treatment will greatly increase their resistance to moisture and rot, commonly considered their two biggest shortcomings. One more thing – note that pressure treated wood come in two varieties: above ground and ground contact. For any part of your shed, deck, etc. that will be in direct contact with the ground below, be sure to use ground contact lumber. Everything else can be above ground if you prefer. In case we haven’t made it clear enough, outdoor wood –whether on a deck, shed or fence—will get serious exposure to the elements. The elements lead to decay and decay leads to destruction. Assuming the best wood available (see above) has been chosen for the job, take care to install a proper drainage system for your structure and treat the wood with additional preservatives. Drainage: Standing water is the enemy! Even if your lumber has been treated with a water-repellent, it’s only a semi-permanent/effective deterrent. Take reasonable care to avoid pools, puddles and otherwise constant exposure to dampness. For roofs, properly installed gutter systems, tarring/shingling and gradient implementation will help water run away from any shed, greenhouse or gazebo. For decks, fences and other wooden structures, find ways of encouraging drainage (like the gaps between deck floor planking) without compromising the aesthetic integrity of the structure. Preservation: Once again, it’s important to reiterative that nothing beats pressure treatment for effectiveness. Due to its higher cost, it may not be reasonable to expect that the entire structure consists of pressure treated lumber, but try to ensure that all load bearing pieces (joints, posts, beams) and all ground-contact pieces receive full pressure treatment. Requiring a great deal of industrial equipment and know-how, Do-It-Yourself-ers cannot perform pressure-treatment. Only non-pressure wood treatments can be done at home, and of the various non-pressure options, spray or brushed solutions are far and away the most common. For the fiscally frugal, keep in mind non-pressure treatment still offers surprisingly adequate protection, especially when coupled with higher quality woods. In many cases, it’s fair to think of the difference between non-pressure treated and pressure treated as the same difference between “good” and “great”, so don’t get discouraged. 1: Wear latex or rubber gloves, eye-protection and (if spraying) a mask, as well as ruin-able clothing to fully protect both arms and legs. 2: Prepare the wood. Try to sand down any ridges or inconsistencies in the lumber, smoothing out knots and end-cuts. 3: Liberally apply the liquid treatment in at least two coats, taking care to allow the first coat to completely dry before applying the second. By liberally, it is meant the solution should permeate every square inch of surface area, especially around natural cracks, end cuts and nail/screw holes. At this stage, an important distinction requires attention: the difference between “Preservative Treatment” and “Water Treatment”. Preservative Treatment refers to the application of chemicals (typically pesticides) that deter insects as well as the growth of fungi and bacteria. A diluted solution of borate would be a perfect example of an at-home preservative treatment. Water Treatment (repellant) is the most common form of at-home treatment. They can consist of an oil or water-based liquid (Thompson’s Water Seal for example). By repelling water, this method of treatment also naturally discourages the growth of molds and fungi that could jeopardise the structural integrity of the wood—though it doesn’t do much for pests like termites. With wood selection and treatment out of the way, it’s finally time to talk finishes, of which there are two main varieties: Natural and Unnatural. Though distinct in their own ways, both options require minimal effort to initially apply and equally little in the way of maintenance. 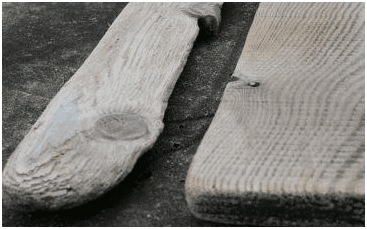 Natural: If your shed uses an expensive wood –like redwood—this will be the finish used. These stains are designed to enhance rather than overpower the natural beauty of the wood, with the pigments ranging from transparent to semi-colored. Pending annual weather patterns, expect to reapply a natural finish every 1-2 years for optimum results. Unnatural: When building anything from rough or cheap lumber (like pine or plywood), preserving “beauty” generally isn’t a high priority. As such, don’t shy away from using unnatural finish. It not only lasts longer than the natural variety, but it will improve the aesthetics of whatever you’ve built because of its heavy pigment. For those who haven’t already guessed it, exterior-paint is the most common unnatural finish applied on basic-use outdoor wood. To obtain the best results, apply at least two coats of primer taking care to make certain the first coat has completely dried before applying the second. Once finished with the primer add a third, final coat of paint, this time of exterior-finish in whatever color preferred. Done properly, unnatural finish has rock-solid longevity lasting anywhere from 5 to 8 years. Live in a city that sits right on the sea? Have a great ocean-front summer home? Take extra precautions to protect the livelihood of your wood. Not only do coastal regions tend to have higher concentrations of moisture in the air than their inland counterparts, but they also have to deal with salt (NaCl) in the air. Those who’ve picked up a piece of driftwood before have likely noticed how soft and almost fuzzy the wood feels. That consistency is a direct result of the salt water and salt spray which eats away at the cellular structure of the wood leaving it seriously weakened. Though not a major concern unless living within a few hundred yards of the water, anyone working on a seaside shed or deck should practice pronounced vigilance in making sure their wood has been adequately treated against chemical contaminants like NaCl. 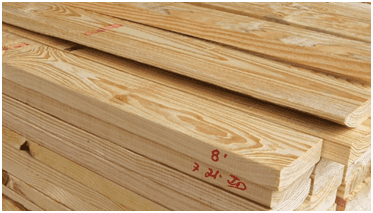 Lumber selection: Choosing the right material for your project is the all important first step. Treatment selection: Always apply a water treatment. Also consider a preservative treatment, unless your wood was pressure treated in advance. Finish selection: Find a finish that suits the needs and aesthetics of the wood. Don’t overpower the natural look of the lumber unless it’s necessary. You should write textbooks on this stuff. in country ,we used oil ( used car oil) to preserve wood especially for construction.How effective is this.I am currently roofing my house but its raining.Would you advice that i use this on wet wood? Thanks for your comments. Your right old car oil can be used to preserve wood. This method is typically used for fencing. It can be very effective if you don’t mind the smell. It’s always best to apply any kind of coating in a dry environment so as to avoid the preservative just getting washed off. It looks like you are in Kenya so finding a sunny day should not be a problem! I use elbow grease as it is very waterproof. Thanks Tommy, I am guessing by “elbow grease” you mean the brand called elbow grease that is the all purpose degreaser. Thanks for the information, I wonder if you can help further? I have a flat packed used shed made from T&G pine, all has been stained previously which is where my dilemma is as when I read preservatives they often refer to smooth or rough finished wood and un treated, my shed is smooth but treated. On the old floor I’ve used Creocote (oil based) mixed with engine oil as looks isnt important. So what should I use to preserve and to re-stain my shed, at present its a aqua green but colour doesnt matter as doing the job right. I dont really want to sand back to bear wood as some preservatives request. Also for information I’ve bought pressure treated T&G to replace one side of the shed. Hi John, re-staining the shed should not be an issue. In many cases the manufactures actually recommend you do this annually anyway. Just clean off any muck and other surface debris before you apply it. I will also run this past one of our team members that formally spent many years working for the wood preserving company Ronseal to see if he can add anything. As Richard says, I worked in the technical team at Ronseal for many years and we were often asked similar questions to yours. Wood preservers often ask the shed owner to sand back to bare wood before applying, because most stains or paints form a barrier on the surface that can then stop the wood preserver from sinking in and doing its job. If the green paint or stain that is currently there is old and possibly flaking in places then it may not present much of a problem. I would advise sanding thoroughly however, with something such as 120 grade sandpaper, to form key and aid penetration. This is especially important on smooth planed woods, as whilst they are higher quality they are also more difficult for preservers to penetrate into, and for paints to adhere to. 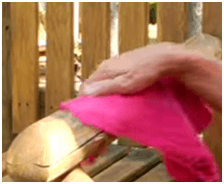 If you buy a coloured wood preserver this can do both jobs at once, protecting the wood from wet rot as well as giving it protection from UV light that can otherwise fade wood. It would also be wise to buy a darker colour, such as a walnut brown, as this will stop any acqua green from showing through. With the new pressure treated T&G you mention, it will be worth leaving it for around six months before painting or staining it, as the initial tanalisation process makes it very difficult for paints or stains to adhere. In summary, I would advice sanding thoroughly, even if not fully back to bare wood, and then using a coloured wood preserver that will do two jobs in one. Always do a test area first as well, to ensure that you’re happy with the colour and that it takes correctly. Is it worth paying extra and getting a pressure treated shed or is it better to just stain/treat it yourself? Yes it is worth paying extra for a pressure treated shed in our opinion. They last a lot longer and the product guarantee is usually longer and will not include the get out of jail card the manufactures use of having to treat the wood annually. 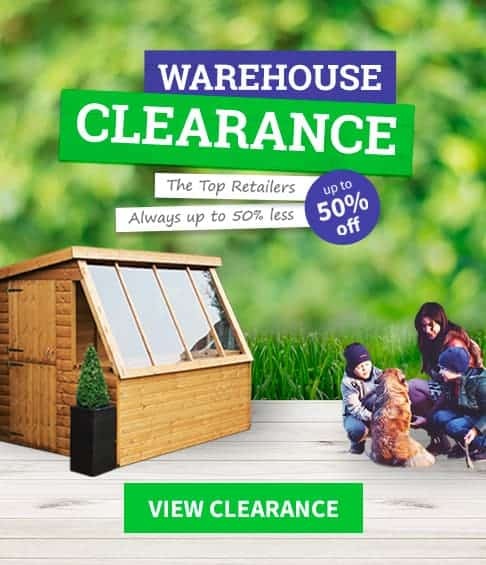 If you buy a shed that requires staining or treatment yourself then although they often come with a 10 or 15 year guarantee, in order for the guarantee to be valid then the manufacturer requires that you treat the wood annually. Thanks, that really helped me make up my mind. Getting a apex 19mm preasure treated shed. Hi. I’m not sure what my external wood on my shed is but it is smooth and “log effect”. I was told the timber frame was pressure treated but appears wet at present. The company said let it dry out so that’s the stage I am at at the moment. When it comes to finishing the external wood, do I need to put a preserver on it then a protector paint or can I go with only a clear preserver to finish it? My wife likes the natural colour of the shed and the only finish paints that I can see on the market that are clear are preserver type paints. What do you think? Any replies and ideas welcome. I’m building a tree house approximately 2.3 metres above the ground in my garden. Its secured to the tree and further supported on wooden poles embedded in concrete. The base is untreated pine and the sides are 18mm ply wood board. The wood are all new and untreated. What is the best treatment to preserve the wood against termites and elements such as rain and sun. 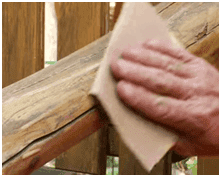 Are wood preservatives that you can buy at the hardware stores or paint shops adequate. I like your responses to other inquiries. Hi Sulaiman, the best solution would be to use wood that has been pressure treated. This way you will not need to treat the wood. Having said that you have already said you are using pine. The best solution would likely be an oil based wood preserve. Most wood preserves that you can buy in a store will be adequate. hi, I am building a small cottage with wood, but am worried that rain might destroy it when it rains as it would soak water and then smell. 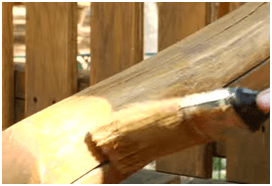 can paint prevent water from direct contact with the wood? Hi Maureen, yes you can paint it but you would be better to use a coloured wood preserve. My question is it will be housing a Lay-z Spa. What is the best treatment for both inside and out. I heard Danish Oil or Decking Oil but there are so many products on the market and I know nothing about sheds. I am looking for advise on how to best treat it. I will be laying foam mats and lino on the floor siliconed around the edges, but not sure if the floor should be treated beforehand as well. The base of my shed at the back has started to let a little damp in, although the wood seems in reasonable condition apart from a little mould. If I were to apply a water seal (eg Thompson’s) and a preservative treatment, which should I apply first? Thank you for your article. It was helpful . I am building a deck frame approx 8m by 3.2m and I have a load of reclaimed heavy duty floor joists for the frame, about 2.5 by 7 inches. Would Cuprinol ducksback be a suitable and effective preservative or am I better off with Bitumen paint?